Barcelona have been handed a potential injury setback as there are fears that Ousmane Dembele has sustained a hamstring problem. The Catalan giants saw off Lyon in the second leg of their last-16 Champions League tie on Wednesday night, with Dembele getting on the scoresheet. 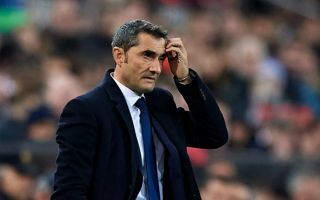 That in turn keeps Ernesto Valverde’s side in the hunt for a treble this season, as they sit seven points clear at the top of the La Liga table and have booked their place in the Copa del Rey final too. With that in mind, they will be desperate to have as close to a fully-fit squad as possible in the coming weeks in order to continue to have quality depth to rotate across all competitions. However, as reported by Mundo Deportivo, there is now concern over Dembele as it’s suggested that he potentially aggravated his left hamstring injury after scoring in the win over Lyon and could now face a spell on the sidelines. It’s added that the French international will now undergo further tests on Thursday morning to discover the full extent of the issue, but Barcelona are said to be expecting him to miss Sunday’s encounter with Real Betis at the very least, as well as the international break with France. If further tests do show that he will now face a spell on the treatment table, that will be bitterly frustrating for the 21-year-old too as he has impressed this season with 14 goals and eight assists in 35 appearances. With his pace, movement and eye for goal, Dembele offers a different dynamic in the final third for Valverde, and so he’ll be desperate for good news on Thursday in that his attacker will perhaps be available after the international break at least.